Last weekend we invited all our neighbors over for a pizza party. It was such a fun way to host a lot of people in our little house. We kept pizzas rolling out of the oven all afternoon; an all pepperoni for the kids, caramelized onion and mushroom, sausage and cotija , mozzarella and tomato, and an attempt at Pizzeria Bianco's famous Rosa (red onion, pistachio and Parmesan). One of the things that I love about this recipe is that it forces you to prepare the day before. And once the dough is prepped, forming the crust and topping it is simple. And only takes 12 minutes to cook. The way I see it, it's no harder than throwing a frozen pizza in the oven. So why not make your own? Note: This crust is best when it proofs for an entire day. Make the crust the night before you plan on serving the pizza. This has the added benefit of making pizza night fast and easy! 1. Combine heritage pizza flour, sugar, yeast and salt in a food processor (use the metal blade and the “dough” setting if you have one). While the food processor is on, slowly feed the water through the top. When the flour is thoroughly wetted, add the olive oil. 2. When the dough pulls away from the sides of the food processor, turn the food processor off and turn the dough out onto a clean work-surface. 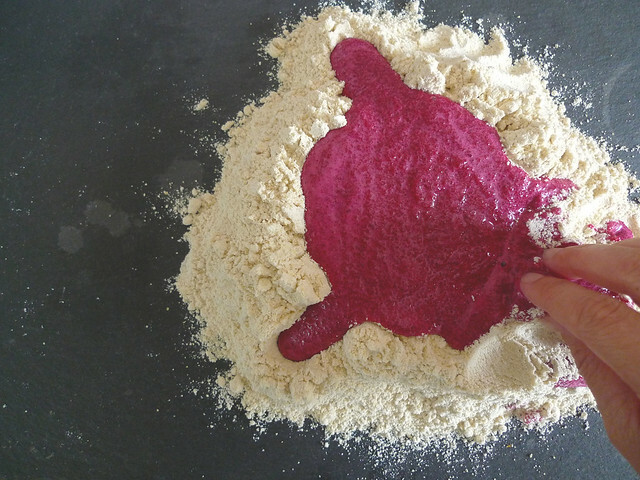 Knead the dough for 5 minutes, working out any tough spots with the heal of your hand. Dust with extra flour if the dough sticks. Form the dough into a smooth ball and place in an oiled bowl, cover with plastic wrap and set aside in the fridge for 24 hours. 3. When you are ready to form your crusts, take the dough out of the fridge, split it into two sections and form into tight balls. Cover them with plastic wrap and allow to come to room temperature. Place a pizza stone in the middle of the oven and preheat to 500 degrees. 4. Take one of the dough balls, dust with extra flour and stretch into a 12 inch circle. Place crust on a well floured pizza-peel, top with all your favorites, and then slide onto the pizza stone and cook for 12 minutes. **If you like a lighter sweeter crust, this recipe also works with our White Sonora Type 00 flour. Use the same amount. 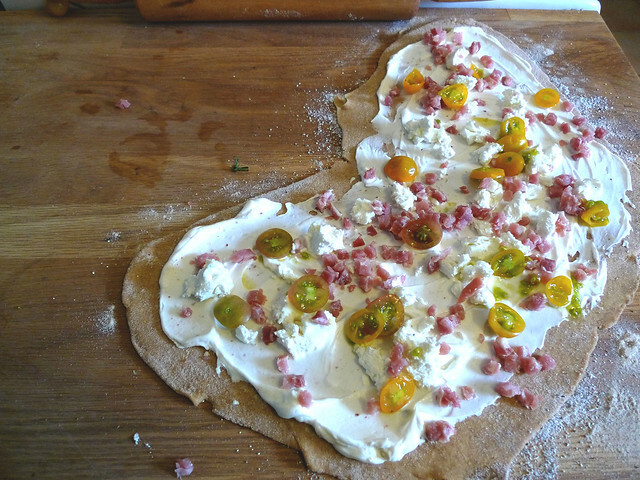 Posted on March 5, 2014 by Emma Zimmerman and filed under Dinner, Recipe and tagged Pizza Flour 2014. One of the best things about having our mill in the back of Pane Bianco is learning from Chef Robbie. Robbie is a walking Larousse Gastronomique, but you wouldn't know it because he likes cooking more than talking about cooking. But if you ever need to identify the odd chili pepper or learn how to cook a strange bean or make pickles that taste like your grandma's-- you should ask Robbie. He cooks as if he's remembering a past life as an Italian Nonna; he knows how things are supposed to be. And that's why the hand-pulled mozzarella sandwich at Pane Bianco is consistently the most delightful thing your'll ever eat. Robbie taught me how to make these cavatelli. How to transform a bit of semolina and '00' flour into beautiful spirals with a simple wooden board. How to keep them light and fluffy. And how to make sure the don't get too thick and chewy. His advice for perfect cavatelli: "Use your whole thumb." And if you attempt to make your own hand rolled cavatelli, this will be the best piece of advice you've ever heard. Since Robbie's not here to teach us all how to make the perfect cavatelli, here are detailed instructions and pictures of the process. Place your small square of dough at the middle-top of the cavatelli board, then use your thumb to press the dough into the board. Still pressing your thumb into the board, smear the dough away from the handle. The dough should start to curl up behind your thumb. To finish, help the cavatelli roll over on itself, and knock it off the end of the board. It will take a few tries to get the hang of it. Mistakes can easily be re-incorporated back into the snake and formed again. Measure out the Pasta Flour into a big bowl. Make a indentation in the middle of the flour to hold the water. Pour the water into this indentation and use a fork to slowly incorporate the flour into the pool of water. It will begin to form a ball of dough. Put the dough on a flour-dusted surface and knead vigorously for 5-10 minutes. It should be a smooth ball when you are finished. Wrap the dough in plastic and set aside at room temperature to rest for 30 mins - 1 hour. Unwrap the rested dough, cut it into 6 sections. Work with one section at a time keeping the rest under the plastic so it doesn't dry out. Shape the dough into a long skinny snake. Using a dough scraper or knife cut the dough-snake into 1 inch sections. One-by-one shape the 1 inch sections into cavatelli using the detailed instructions and pictures above. Repeat the process with the remaining 5 sections of dough. When you have a great big pile of cavatelli throw them into a well-salted pot of boiling water and cook for 3-5 minutes (divide into 2 or 3 batches if your pot is small). Cavatelli are great with any red of white sauce. But I love eating them right out of the water, with a drizzle of good olive oil, cracked pepper and a hefty garnish of Parmesan cheese. + My dough is too tough? Add another tablespoon water and knead for another 5 minutes. + My cavatelli sticking to the board? 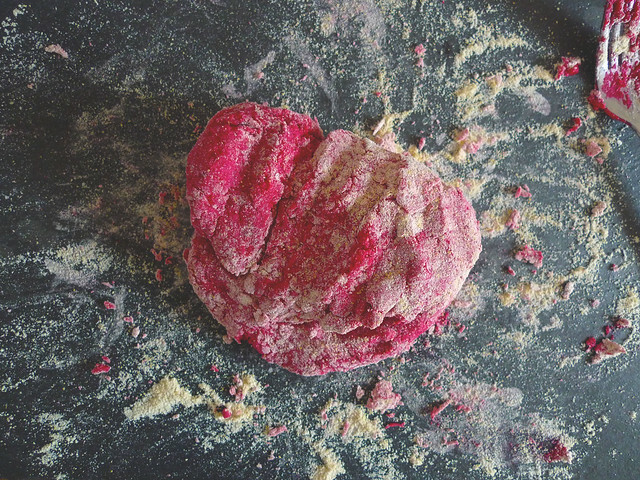 Dust your cavatelli board with pasta flour. + My cavatelli are dry in the middle after boiling them? They might be too thick. Try boiling them a few minutes longer. 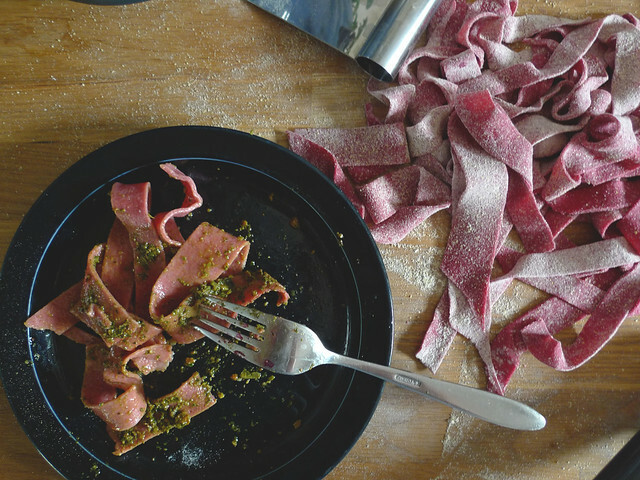 Posted on February 5, 2014 by Emma Zimmerman and filed under Dinner, Recipe and tagged Pasta Flour 2014. Our family got a really neat Christmas present from the Grandparents: an Italian pasta roller! 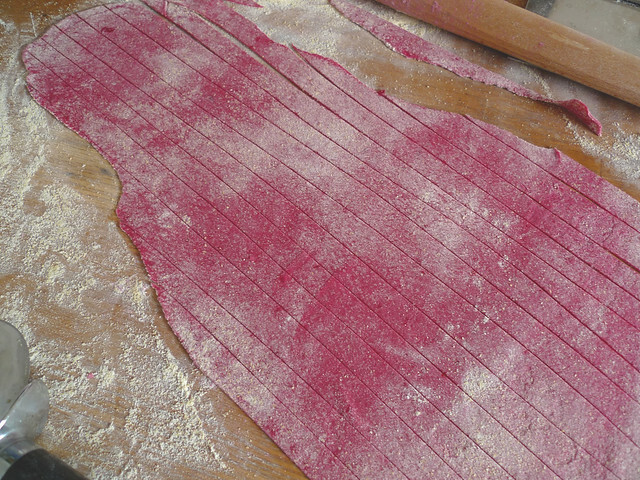 This is the first time we've made pasta by hand, and we were surprised at how easy it is. It really helps to weigh the flour, but if you don't have a scale, use about 3 cups. 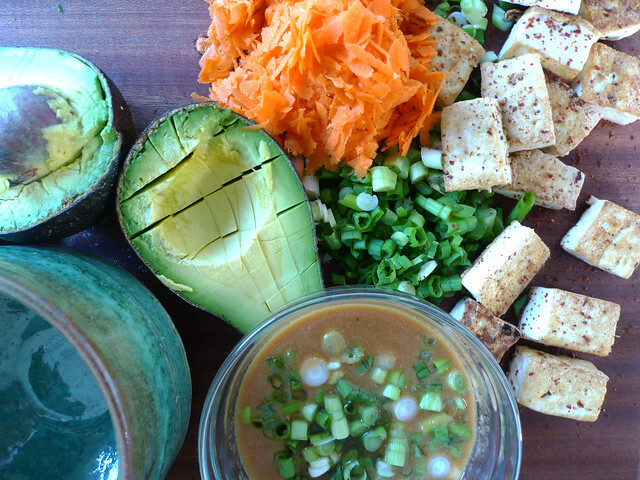 We started off in a bowl as to not make a huge mess, but if you are adventurous, mix everything on a clean countertop. Make a well in the flour for the eggs, then start mixing with a fork until the dough starts to come together. Now start kneading with your hands. If it's too sticky, add a bit more flour. If the dough seems crumbly, dip your fingers in water and work that into the dough. When you can set the dough on a clean countertop without sticking, the dough is ready to be shaped into a ball. Wrap the dough ball in plastic wrap and let it sit for 30 minutes to an hour. This lets the gluten relax so the dough doesn't shrink while you roll it. Now for the fun part! Split your dough ball into manageable pieces, and roll in your pasta roller. 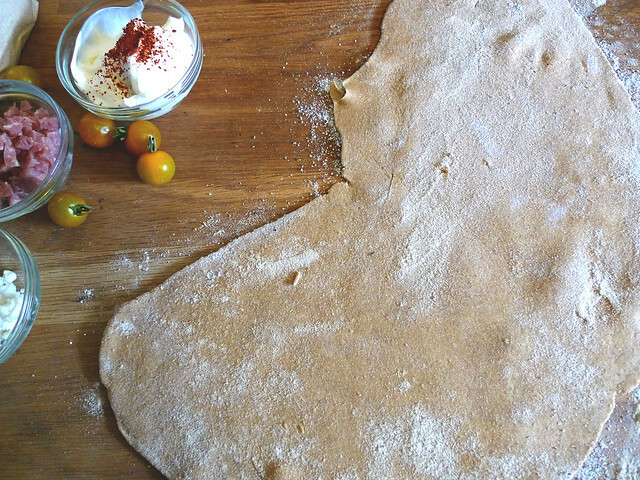 If you don't have a fancy machine, grab a rolling pin and a pizza cutter (learn how here). We chose to use the fettuccine attachment. When your pasta is the shape you want, dust it with a bit of flour to keep from sticking together, and let them rest and dry for about a half hour before cooking. For our fettuccine, we paired it with a white wine butter sauce, broccolini and salmon. The light sauce really let the flavor of the pasta shine through. Whatever you serve your pasta with, be creative and enjoy! Posted on January 17, 2014 by Taylor Tolmachoff and filed under Dinner, Recipe and tagged Pasta Flour 2014. 1. 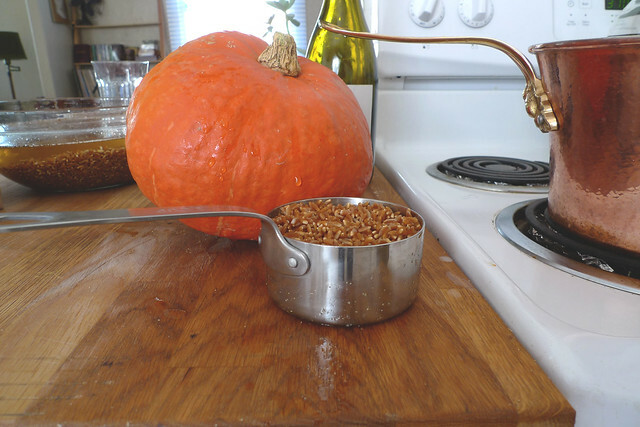 Put the farro in a sauce pan with 2 1/2 cups water. 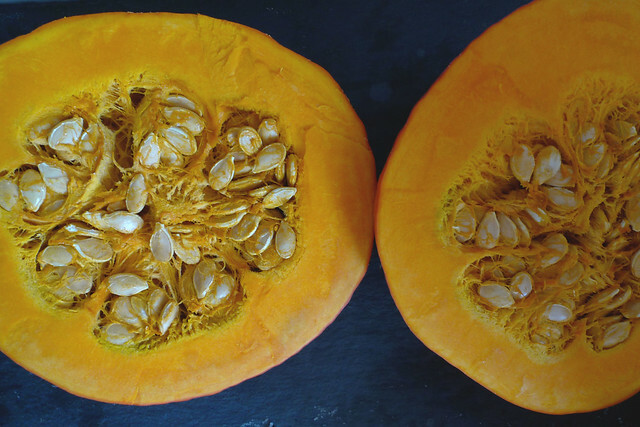 Bring to a boil and allow to simmer for 40 minutes, or until the farro is soft and chewy. 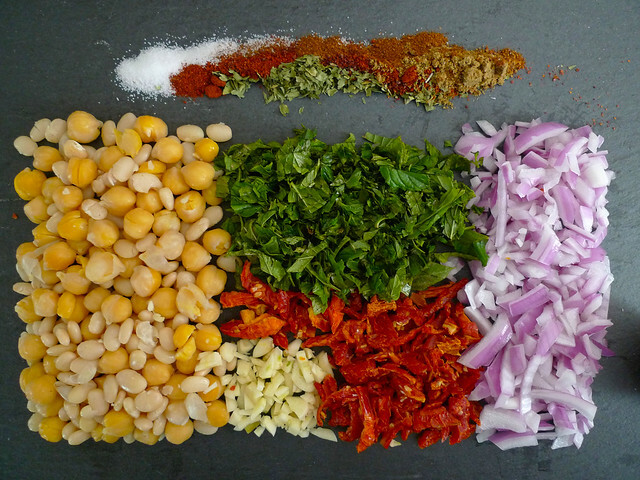 Meanwhile, blend all of the dressing ingredients together and set aside. 2. Heat an iron skillet with coconut oil. Fry the tofu cubes on both sides until golden. Approximately 2 minutes on each side. 3. 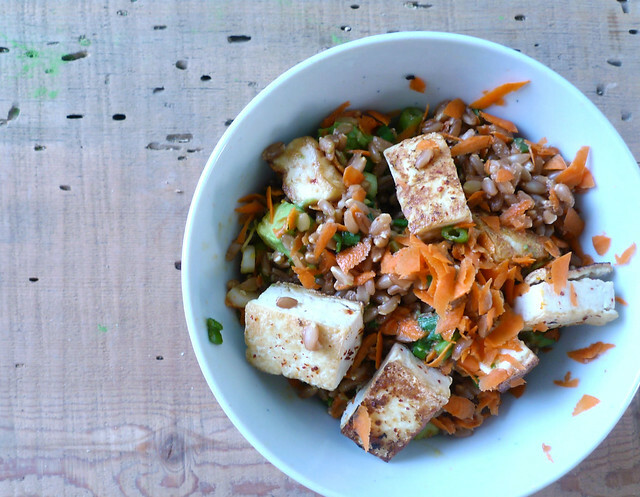 Lastly, toss chopped vegetables, cooked farro, fried tofu squares and dressing in a large bowl. Enjoy! 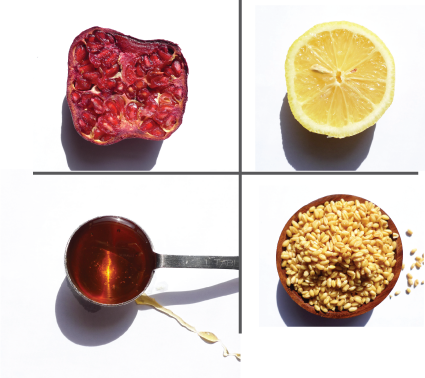 Posted on September 26, 2013 by Emma Zimmerman and filed under Dinner, Recipe and tagged Farro Berries 2013. 1. Mix flour and salt together. Then add the olive oil and warm water. 2. 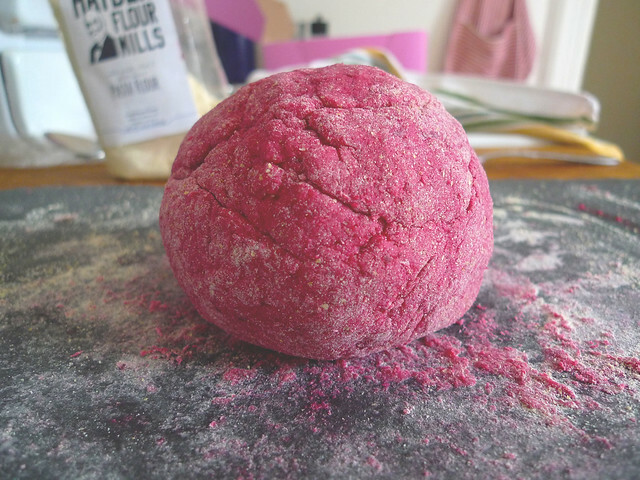 Knead the dough together with your hands for 5 minutes, or until the dough comes together in a ball. 3. Lightly oil the ball of dough and wrap it in plastic wrap. Set aside for 30 minutes at room temperature. 4. While you are resting your dough, pre-heat the oven to 450 F.
5. After the dough has rested, unwrap and divide in to two pieces. 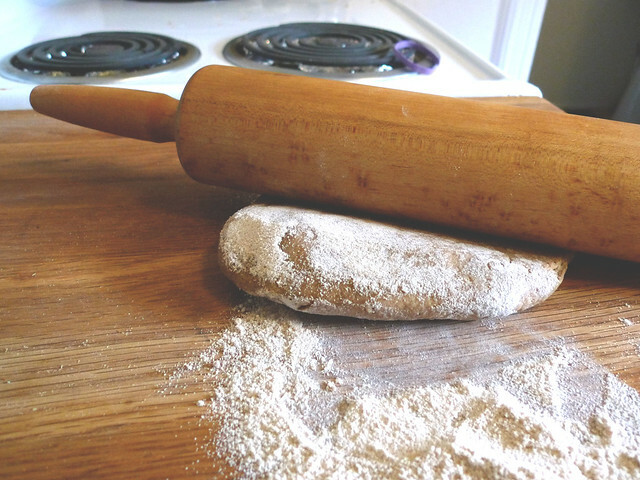 Use a rolling pin to flatten the dough into a thin sheet. Cut into whatever shape you like. 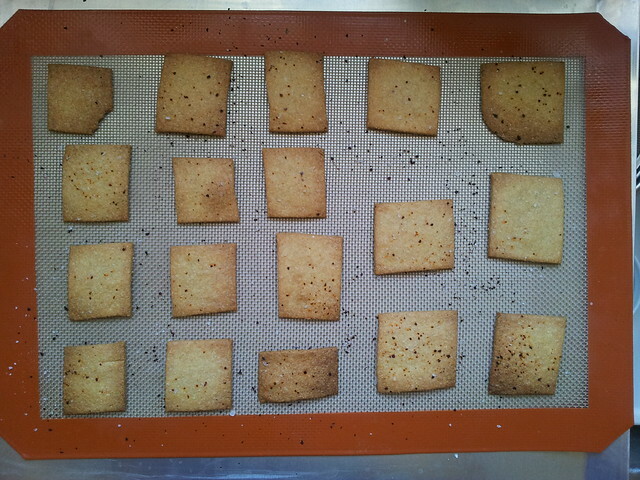 Then place onto a cookie sheet lines with parchment paper. Cook for 8-10 minutes. Until they are a rich golden color. 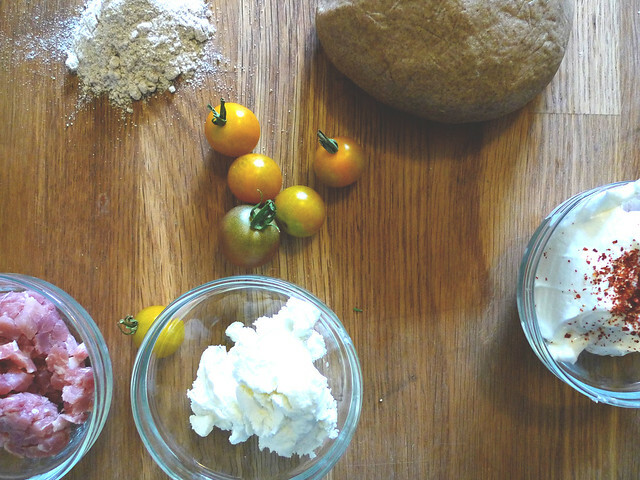 Posted on April 11, 2013 by Emma and filed under Dinner, Recipe and tagged Whole Wheat White Sonora Flour 2013. These are the easiest fake-it-till-you-make-it appetizers. 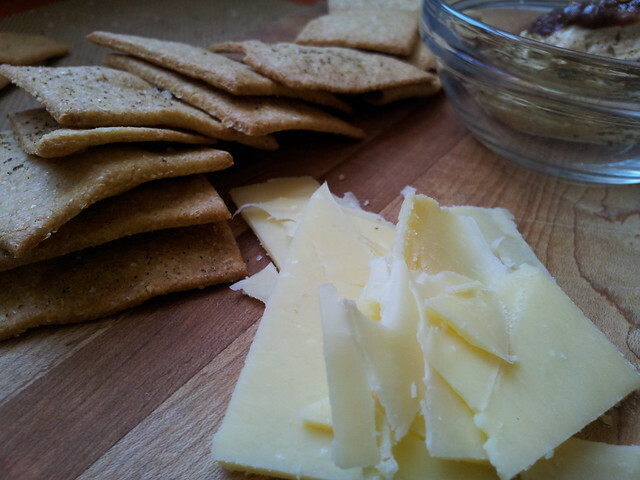 Best when served with a glass of wine on a Friday afternoon. 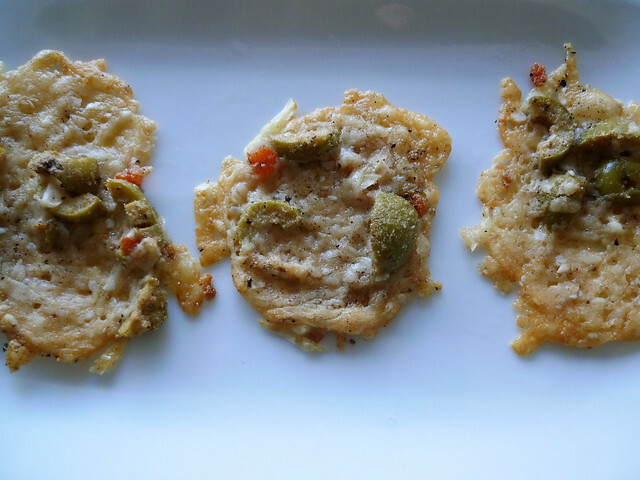 Preheat the oven to 375° F. Stir together, cheese, flour, pepper and olives. Place mounds of mix on Silpat liner. Flatten each mound. Bake in middle of over until golden brown--approximately 10 minutes. Cool for a few minutes. Use a spatula to transfer as Fricos are fragile. 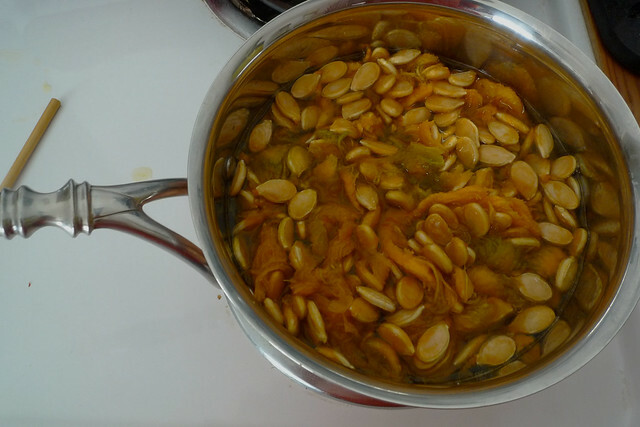 Posted on March 15, 2013 by Emma and filed under Dinner, Recipe and tagged Farro Flour 2013. 1. Create a clean workspace on the kitchen counter. Meaure out the flour and dump it out on the counter and form a flour volcano. Just like you do for the gravy at Thanksgiving. This is where the eggs will go. Crack four eggs and two egg yolks into the top of your flour-volcano. The trick is not to let the volcano errupt with egg juice all over the counter. 2. With a fork or your fingers, very slowly mix the flour into the eggs. Now add the water, it will help the dought come together in a ball. 3. Knead the dough with the heel of your hand. Push the dough away from you and fold it over. Rotate it 90 degress and repeat. After about 10 minutes the dough should start to feel silky. 4. Wrap the dough with plastic wrap and let rest for 30 minutes. This is when you can scrap the sticky dough bits off the counter and pour yourself a glass of wine. 5. Give the dogh a poke. Is it firm and springy? Perfect. 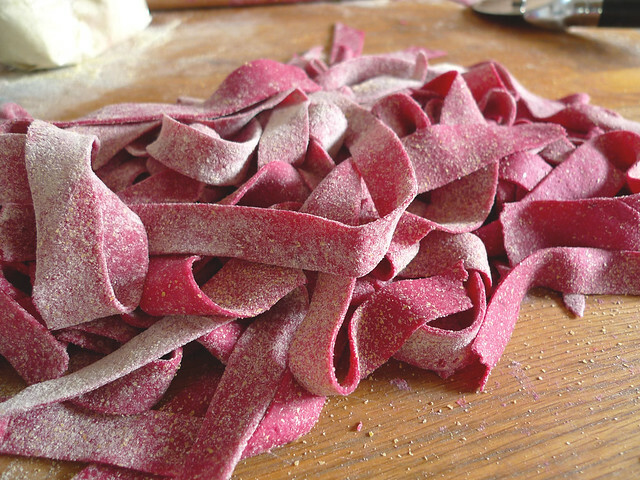 Now you can turn it into noodles, cavatelli, bowties, or ravoili. This is what we use to shape the cavatelli: Beechwood Garganelli Pasta Board. Fantes has so many beautiful pasta making tools. You will want them all. 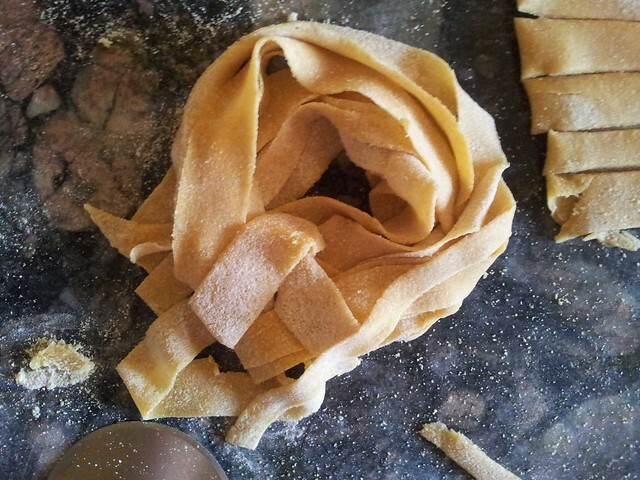 Posted on October 25, 2012 by Emma and filed under Dinner, Recipe and tagged Pasta Flour 2012. That's the basic recipe for farinatas--equal parts chickpea flour and water, plus a bit of salt and a generous amount of pepper. If you get really fancy you can add rosemary and thinly sliced onions. It's so simple. 1. Preheat the oven to 450°F. Put a cast-iron skillet in the oven while it’s pre-heating to warm it up. 2. 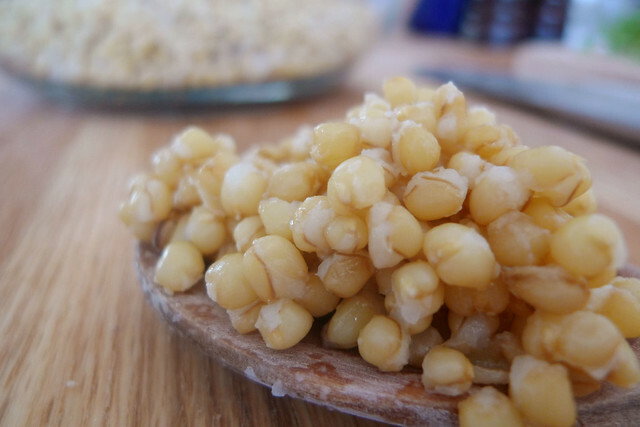 In a medium sized bowl, mix the chickpea flour and water together. Use a whisk, and stir until smoothly integrated. Mix in 2 tablespoons olive oil. Add the onions and rosemary right before you put the batter in the skillet. 3. When the oven is heated, carefully take the cast-iron skillet out of the oven and coat bottom with 2 tablespoons of olive oil. Pour batter evenly over the bottom of the skillet and cook for 12 minutes. 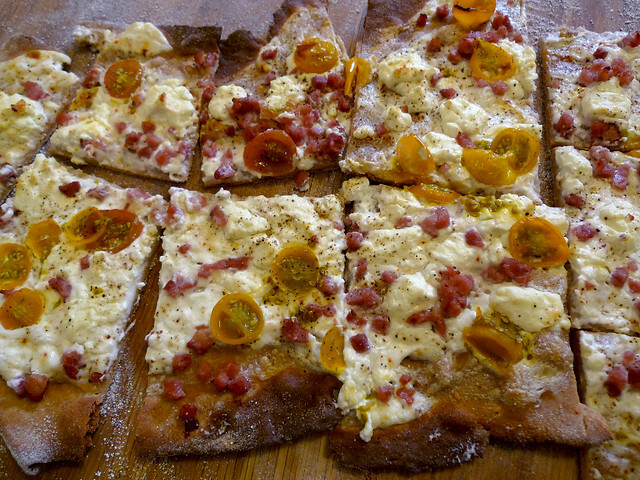 Slice it up like pizza and serve with some olive tapenade as an appetizer. You might have to make a second one! 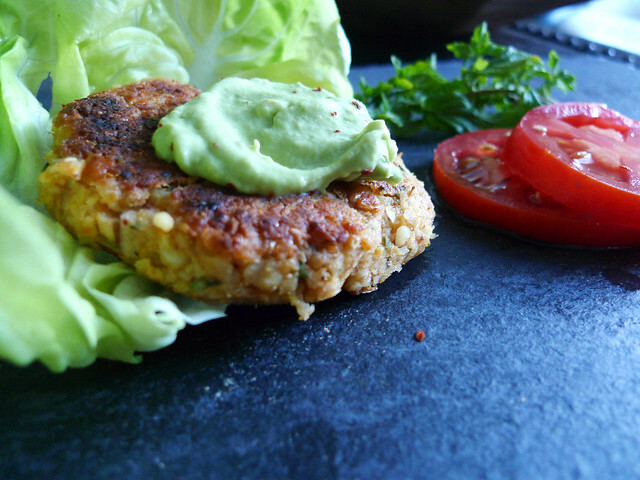 Posted on April 30, 2012 by Emma and filed under Dinner, Recipe and tagged Chickpea Flour 2012. The ham was good. The swisschard tart from the garden was brilliant. But when I went back for seconds, I dished my plate full of this farro salad. Recipe from the Arizona Republic. In a large bowl whisk together the lemon juice, olive oil and pepper to taste. Mix in the feta cheese. 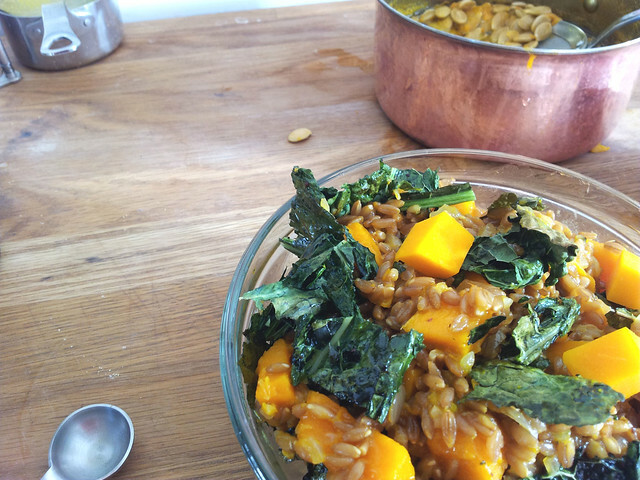 When the farro has cooked and been drained, add it to the bowl and mix well. Set aside for 5 minutes to cool slightly. Mix in the tomatoes, cucumber, scallions and oregano. 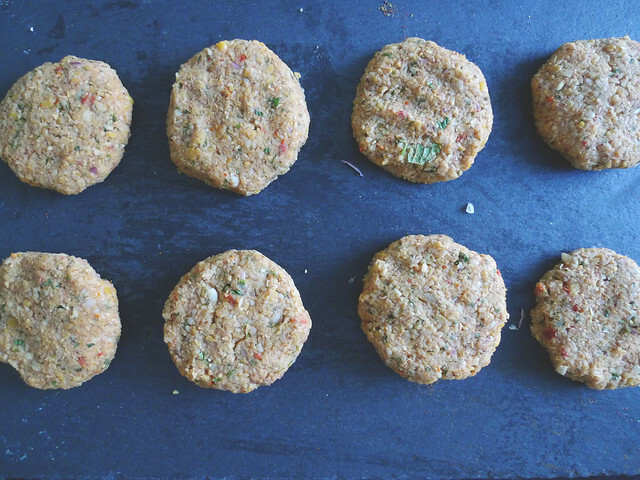 Cut the sausages into 1-inch rounds, then add those to the salad. Sprinkle the salad with the almonds. 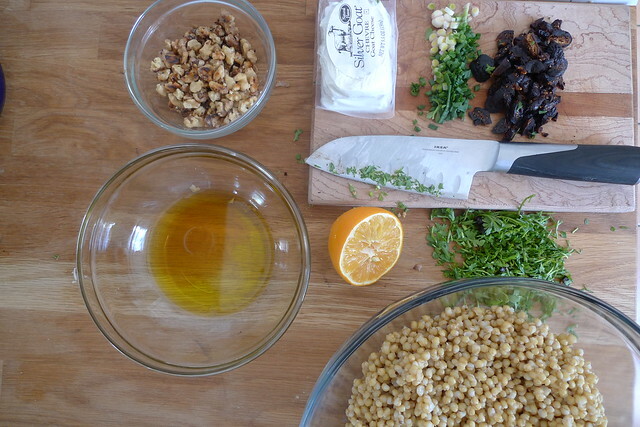 Posted on April 10, 2012 by Emma and filed under Dinner, Recipe and tagged Farro Berries 2012. I judge a city by its street food. If I can walk from one end of the city to the other and never have to sit down to eat: it's a good place. Montreal failed on this account. There was the $2 Chow Mein window, but you had to be a poor and inebriated McGill student. Istanbul wins by miles. The temptations on the sidewalk encourage gluttony. The South of France in the summer takes second place. In Nice you can walk around in your bathing suit (something that doesn't work as well in Istanbul) with hot chickpea fritters called panisse (or panelle in other parts of the world). They are so easy to make so you don't have to go to France to indulge. And if you live in Phoenix, where every weekend from now until May is a good one for a backyard cookout, consider these frites with hamburgers on the grill and some homemade ketchup. 1. Cut a piece of parchment paper to fit on a cookie sheet. Then lightly grease the parchment. 2. Heat the water and 2 teaspoons olive oil in a saucepan. Just before it boils, slowly add the chickpea flour. Use a whisk to stir in the flour as the batter should be smooth. Add white pepper and salt to taste. Cook for 10 more minutes, switch to a wooden spoon and stir constantly. 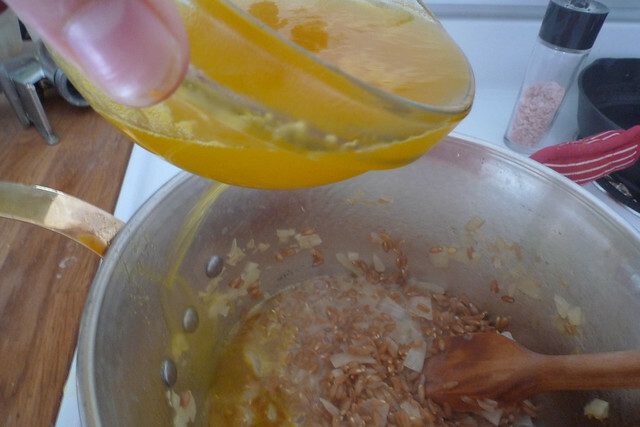 The batter should thicken and pull away from the sides of the saucepan. 3. Spread the batter onto the greased parchment, 1/2 inch thick. Work quickly. When the batter has set, cut it into sticks or whatever fun shape you like. 4. In an cast iron skillet, heat the oil. 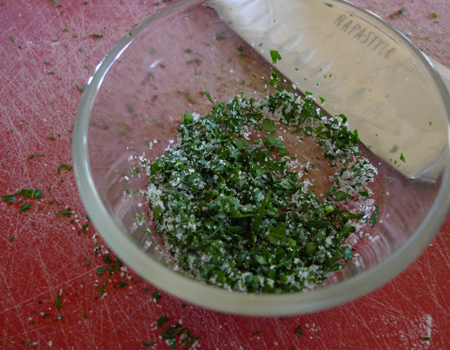 (No more than 1/2 an inch is needed, and vegetable or olive oil will do). Dip in one end of a chickpea stick to test if the oil is ready. If it sizzles it's hot enough. Then add the chickpea sticks, but don't overcrowd the pan. 5. Use tongs to turn the sticks as needed and when they are golden set them on a paper towel to drain off excess oil. 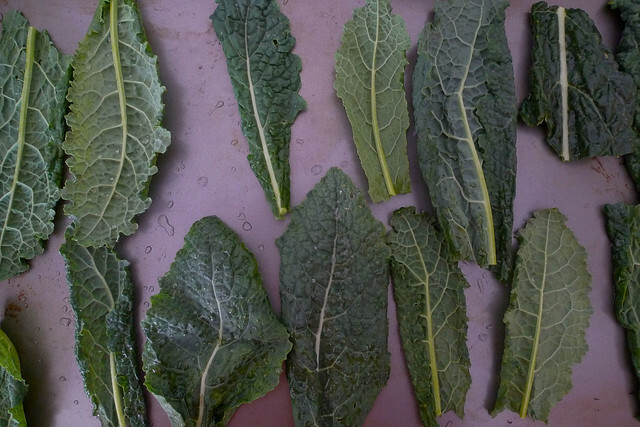 Toss them in parsley and salt. 6. Eat them HOT: crispy on the outside and custardy on the inside! 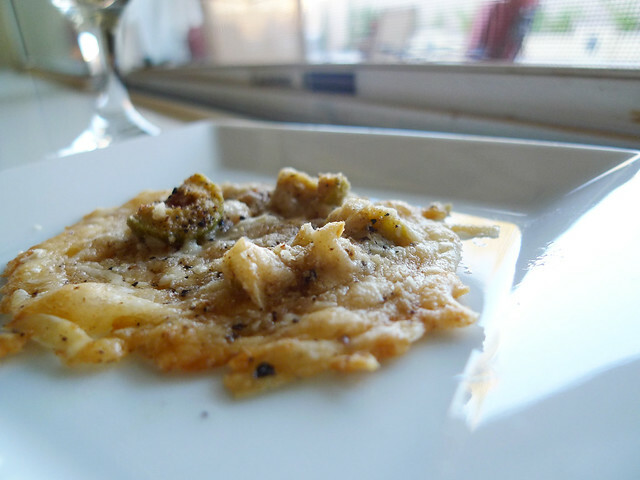 Posted on February 24, 2012 by Emma and filed under Dinner, Recipe and tagged Chickpea Flour 2012.